UNITED NATIONS (AP) - President Donald Trump has massively expanded the ban on providing federal money to international family planning groups that perform abortions or provide abortion information to all organizations receiving U.S. global health assistance. Trump's spokesman Sean Spicer announced Monday that the ban on family planning funding - which was instituted by GOP President Ronald Reagan in 1984 and has bounced in and out of law between Democratic and Republican administrations - had been reinstituted. But it wasn't until the president's memorandum was published Monday night that the expansion came to light. The order directs the secretary of state, in cooperation with the secretary of health and human services, for the first time to extend the requirements in the ban "to global health assistance furnished by all departments or agencies." The ban is known as the Mexico City Policy or Global Gag Rule. Suzanne Ehlers, president of Washington-based Population Action International which lobbies in the U.S. and developing countries for women's reproductive health, told The Associated Press on Tuesday that targeting health assistance expands the amount of U.S. funding affected by a magnitude of 15 times and will impact millions and millions of women in low- and middle-income countries. U.S. support for family planning currently amounts to about $575 million in 40 countries, she said, while global health assistance totals about $9 billion to about 60 countries. Any international organization receiving U.S. funds for health programs will now be required to certify that it does not provide abortion services, counseling, referrals or information or advocate for the liberalization of abortion laws, even with non-U.S. funds. If they don't, their funding will be cut off. The effects of this "massive expansion ... are so enormous that the American public should be outraged that we really are trying to cut off life-saving basic health services to the poorest women anywhere in the world," Ehlers said. "It's like a complete abomination of U.S. leadership and partnership." She said members of the House and Senate need to know that Trump "has gone too far." U.S. Senator Jeanne Shaheen told fellow lawmakers Tuesday that the expansion "targets some of the most effective health organizations at work in the developing world." "Without funding, these organizations won't be able to provide HIV services and maternal health care, or counsel women on the risks of Zika infection," the New Hampshire Democrat said. Ehlers said programs funded by the U.S. Centers for Disease Control and Prevention, to support child nutrition, and help combat infectious diseases like tuberculosis and malaria are also affected. Shaheen and Sen. Susan Collins, a Maine Republican, introduced legislation late Tuesday to repeal the Global Gag Rule, with support from 43 other senators. A companion bill was introduced in the House by Rep. Nita Lowey, a New York Democrat. "Women's reproductive health care remains under constant assault," Shaheen said, and Trump's action has broadened the assault. "We know that the way to decrease unplanned pregnancies and abortions is to make birth control and family planning services accessible and affordable, not micromanage the type of medical information and reproductive health counseling that women around the world receive," she said. 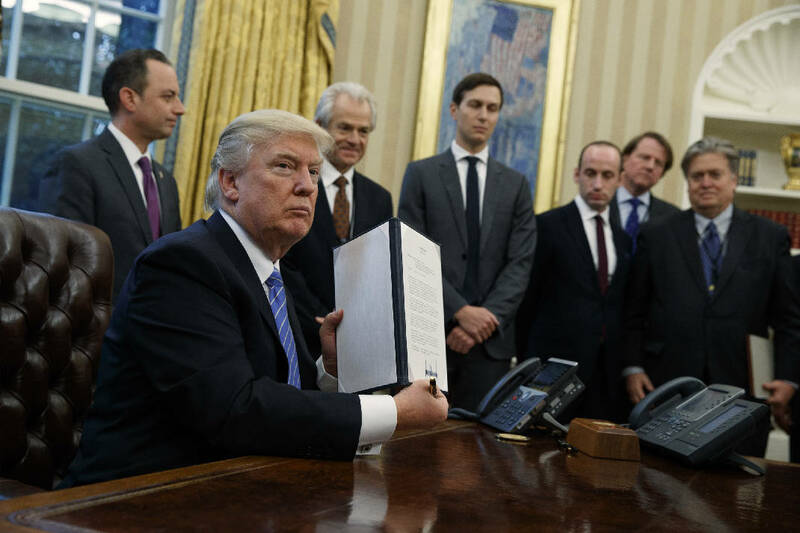 But Trump's reinstatement of the ban drew strong support from Republican lawmakers and anti-abortion groups. Rep. Chris Smith, a New Jersey Republican who co-chairs the Congressional Pro-Life Caucus, said "there is political consensus that taxpayer dollars should not fund abortion and the abortion industry." "Without this protection in place, foreign NGOs receiving U.S. government funds promote and perform abortion throughout the world with the imprimatur of the United States," he said.